Tremolite asbestos is a fibrous amphibole with the chemical composition Ca2Mg 5[Si8O22](OH) 2. It is one of the more hazardous asbestos minerals. Tremolite had a rather limited commercial use and is encountered as an impurity in talc or vermiculite as often as it is as an intentionally added material. In materials with a significant talc content the amount of Tremolite can exceed 1%. It rarely exceeds 1% in vermiculite samples but handling vermiculite that contains Tremolite can result in respiratory exposures thousands of times higher than the allowable industrial exposure. Tremolite has refractive indices that overlap those of Anthophyllite but Tremolite in some orientations will show oblique extinction of from 7 to 21 degrees. Anthophyllite never shows oblique extinction. Tremolite has a lower refractive index than Actinolite. 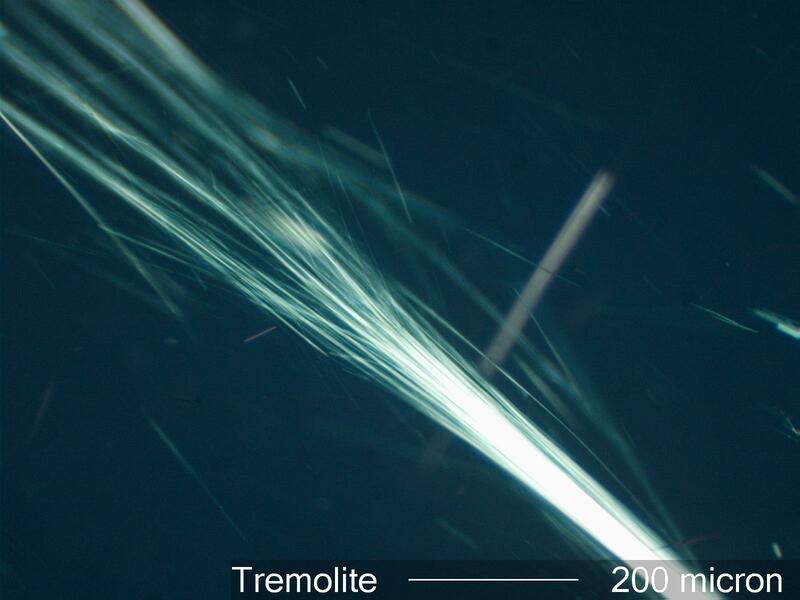 Tremolite shows dispersion effects in high dispersion liquids of 1.605. As an impurity it is generally found with high concentrations of talc or in bulk vermiculite. It was used as an additive in paint and ceramics, mastics, floor tiles, acoustic tiles, and other construction materials. Because of its purity it was often used as a filter material or crucible liner in chemical analyses.